Maps of the United States divided into red for Republican-won states and blue for Democrat-won states are on all television stations’ coverage of presidential campaigns these days. While it seems like this practice has been around forever, its use by news networks is actually fairly recent; first used with the presidential election of 1976. NBC, the first all-color television network, created an illuminated map behind anchor John Chancellor to illustrate how each state’s electorate was voting. 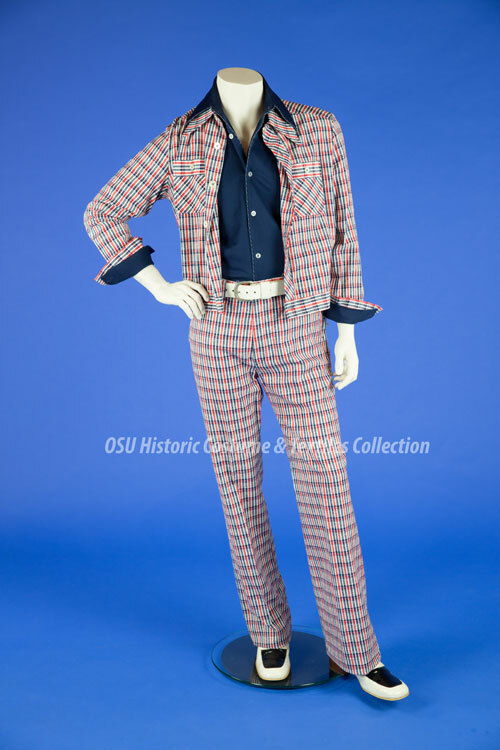 NBC chose red for Jimmy Carter (Democrat), and blue for Gerald Ford (Republican). 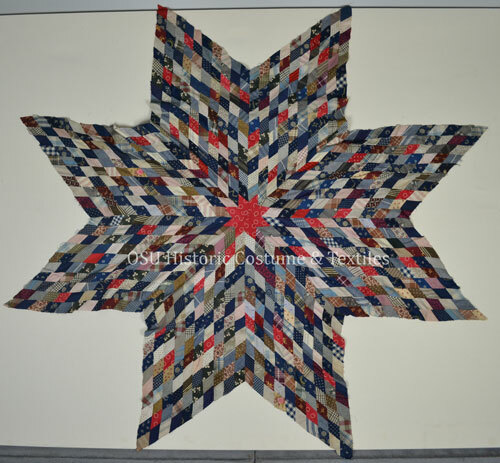 Early on, blue was chosen for the Republican Party due to its association with the Union army during the Civil War and the fact that blue was associated with many of the conservative parties in Europe and elsewhere. 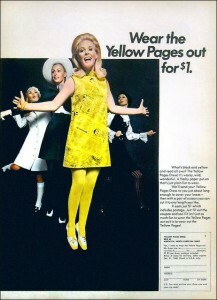 As color broadcasting expanded to the other major TV networks, each news program chose its own color scheme to illustrate voting results. There was no standard among all networks, however. It was not until the highly contested election of 2000 that red states came to refer exclusively to those voting Republican and blue states to those voting Democrat. It has since become a sort of short hand for partisanship. While this color coding of American politics creates a striking visual for election results, it can have unforeseen negative psychological effects. Conor Seyle and Matthew Newman published results which explore the ramifications of defining America in terms of red and blue states. While red and blue are meant to refer to the distribution of electoral votes between Republican and Democrat, media pundits have begun to use red and blue to refer to a broad set of differences, including membership in different groups and social categories such as religion, urban or rural living, socioeconomic status and regional culture. Seyle and Newman write that, “By showing all red states, and all blue states, as being parts of the same political cultures, the red versus blue map ignores compelling differences in regional values and concerns about issues that may lead different states to vote Democratic or Republican for different reasons.” The question posed is why does this change in labeling from Republican and Democrat to red and blue create problems? The answer is somewhat complex but can be broken down in this way. The definitions of Republican and Democratic have nothing to do with membership in other groups. They are based solely on political opinions. In contrast, red and blue are used to refer to a large set of shared opinions, group memberships and perspectives. Seyle and Newman write, “As such, describing a person or group as red implies information not only about their stance on issues such as abortion, gay marriage, and civil liberties but also about their religious memberships, educational backgrounds, and beliefs about the role of America in the world.” The effect of this paradigm is that it encourages people to see political opponents as opponents in all things, thus encouraging a winner takes all approach to public judgement, rather than working together. This often results in a destructive conflict in which people are less willing to incorporate other perspectives and compromise on a happy medium, thus reducing government efficiency and effectiveness. It would, perhaps, be in the best interest of the public for the media to refrain from utilizing the red and blue labels and simply return to referring to each state by the name of the political party who has won the majority of votes. Working together, we are united in Red, White and Blue. D. Conor Seyle and Matthew L. Newman, “A House Divided? : The Psychology of Red and Blue America,” American Psychologist 61 (2006):571-580. 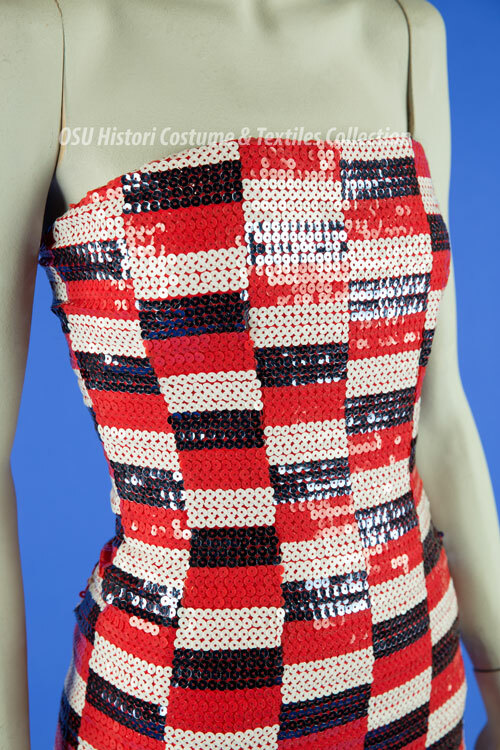 In 1997 Arnold Scaasi donated 56 garments to the Historic Costume & Textiles Collection. 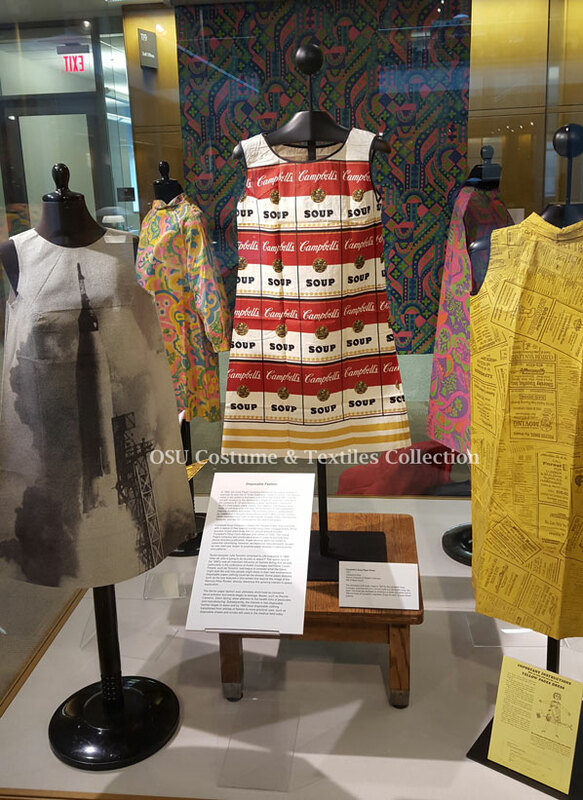 This was a perfect opportunity to feature a retrospective exhibition of his work which in 1998 became the exhibition, The Joy of Dressing Up.. We also held a fundraiser dinner with him as guest of honor. 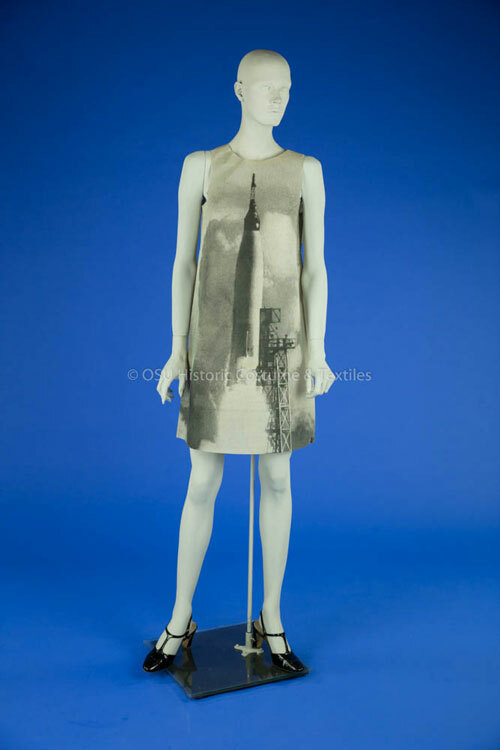 Scaasi and curator Gayle Strege chose the garments featured in the exhibition together, which included a visit to him and his partner of many years, Parker Ladd, in their town home in Manhattan the summer before the exhibition. The dining room was painted red. A few months ago, Arnold Scaasi passed away on August 4th in New York, and we thought it fitting to celebrate his life and sense of color and opulence during this festive season. Red was Arnold Scaasi’s favorite color and he had several examples in his collections over the years. We are featuring two of my favorites in the collection. Both were in the exhibition, and the evening gown was also featured in his first book, A Cut Above. 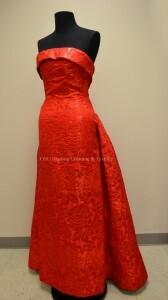 The short red lace cocktail dress is from the Summer 1987 season and you can clearly see the overly large shoulder pads of the period. 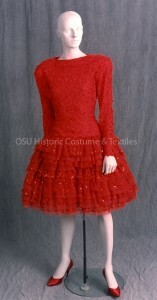 The elongated torso tops a tiered skirt of 11 alternating layers of ruffled lace with sequins and stiff red net. The strapless evening gown is from the Fall 1992 collection. 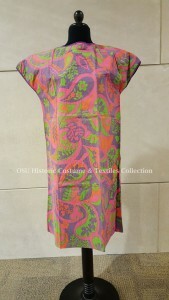 It is a matelassé fabric with a shiny lurex yarn woven into the floral pattern. 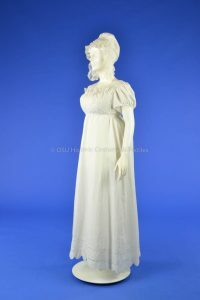 The dress itself is narrow, but has a voluminous bustle attached to the rear, reminiscent of some gowns from the 1950s when Scaasi first came on the fashion scene. 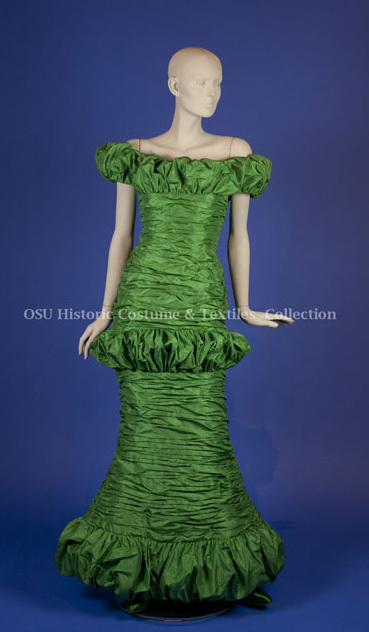 The green evening gown of gathered silk taffeta with puffs at the sleeves and neckline, hip and flared hem was in the exhibition and also featured in A Cut Above. 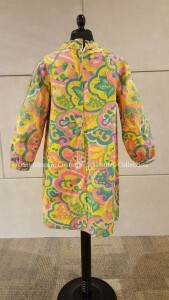 It was part of the Fall 1988 collection. 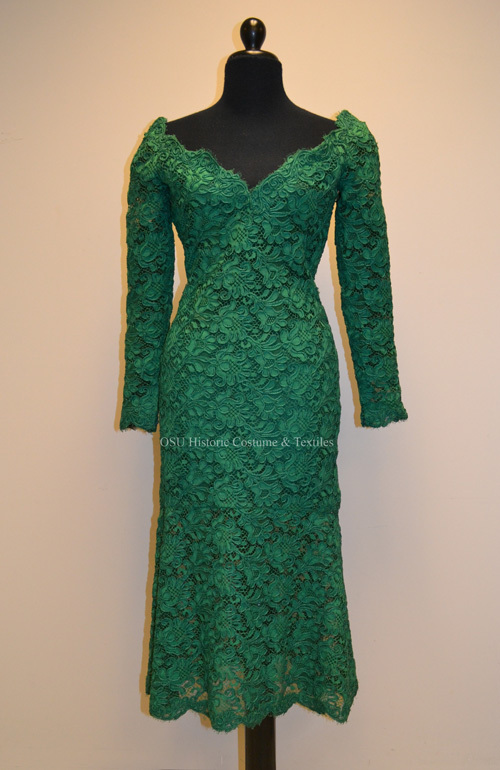 The green corded lace dress is a complement to the short red lace dress. It too has long sleeves but has an off-the-shoulder V neckline and a longer flared trumpet skirt. Like the strapless red gown, it was from the Fall 1992 season. 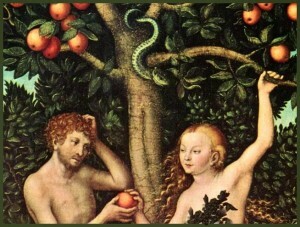 One wonders if perhaps Scaasi might have had Christmas on his mind in putting these two together in the same collection. 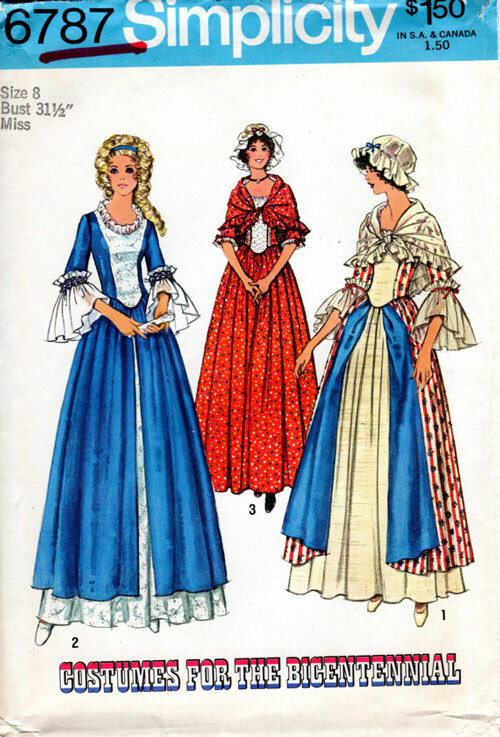 The Scaasi dresses featured in this post were chosen due to their red and green color which have traditionally been associated with the Christmas season, but just how long have red and green been the “official” colors of Christmas? Turns out, it may be longer than one originally supposes. 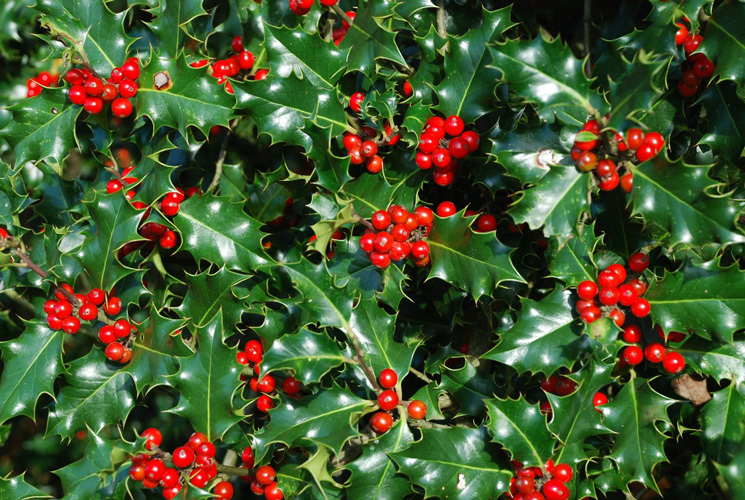 Long before Christmas began to be celebrated on December 25, various other cultures, such as the Celts, celebrated the winter solstice by decorating hearths and homes with evergreen branches. Evergreens do not die during the winter thus symbolizing the eternal aspect of the divine as well as the approaching longer days and return of spring. Several groups celebrated this return of sun, such as the Roman festival of Saturnalia and the Persian celebration of their sun god, Mithras. 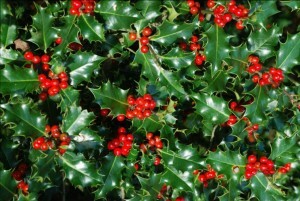 This, along with the popularity of holly as an evergreen decoration which has red berries, led to the association of the color red along green with the Christmas holiday. 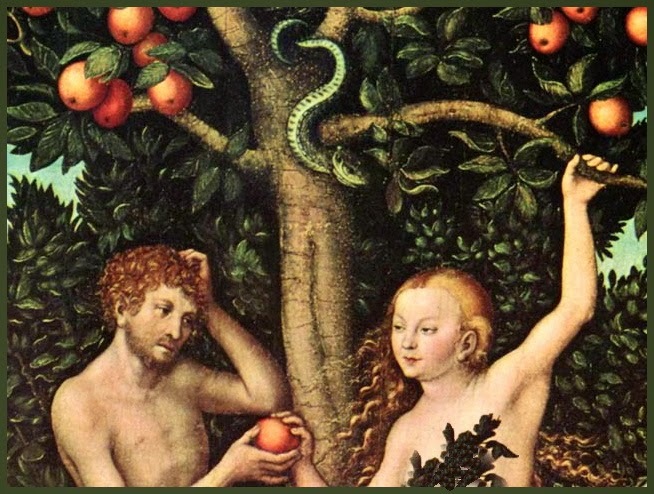 So as you dress up in your cheeriest ensembles this holiday season just remember, that red and green ensemble you’re wearing is a festive nod to fall of humankind from Paradise–and hope for redemption. 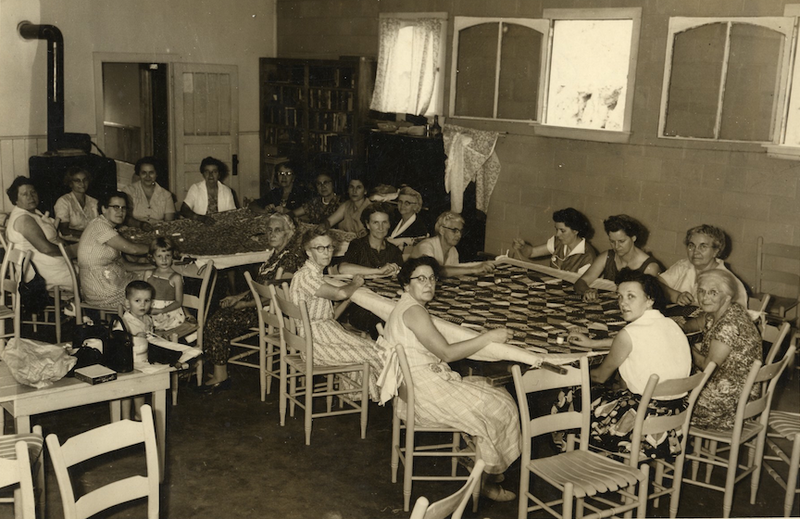 …to grandmother’s house we go,” for the Thanksgiving and Christmas holidays or so the song implies. 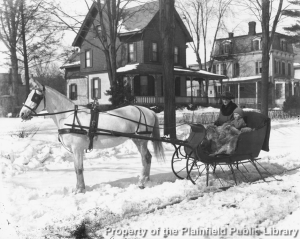 As the colder winter months approach and we turn to sweaters, boots and cozy nights by the fire, we take a look back at how people kept warm while traveling 100 years ago. Before seat warmers, heat or even windows were standard features on cars, people had to find ways to stay warm while riding to and from their destinations. This could be achieved in a variety of ways from heated bricks to heavy fur coats. 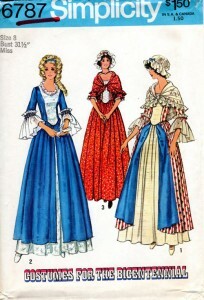 One of the most common methods, however, was the carriage blanket. The carriage blanket, also known as a lap robe, was a necessity in the winter. 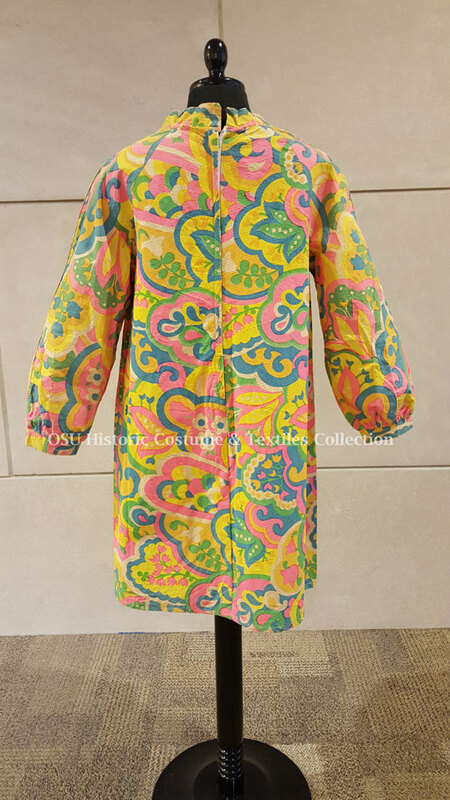 For more information on lap robes and wonderful period photos of advertisements featuring them, check out this blog post from the Fountainhead Antique Auto Museum . Our post discusses three such fur blankets that are a part of the Historic Costume & Textiles Collection. It is important to remember that fur was one of the few options people had to stay warm during the winter. Synthetic fibers such as acrylic, polyester, Thinsulate and polar fleece would not be available until years later. The fur lap robes worn in open carriages and sleighs, and later automobiles, were often made of durable furs such as bear, or American bison to withstand the wear and tear. Bison was almost hunted to extinction in the 19th century because of its hide. This animal, which provided many staple products used for centuries by inhabitants of the North American plains, was heavily hunted and exported to the British military during the Crimean War (1854-56), and exploited by passengers in railroad cars wantonly shooting bison on the way to California in the 1870s. The buffalo lap robe featured in this post was used in Oklahoma between 1909 and 1912. 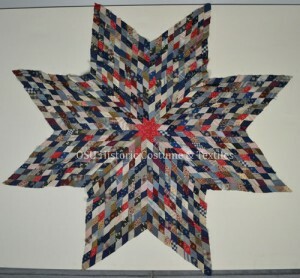 It belonged to Henry Paul Miller, the son of a farmer, who was born in Galena, Ohio in 1865. Henry engaged in farming as well before graduating from Ohio State University Veterinary College in 1897. He married Emma Pierson in 1891 and had four sons before taking a teaching position with the Agriculture College of Oklahoma in 1909. The family would spend about three years in Oklahoma before Henry was appointed the first County Agricultural agent in Ohio for Portage County in 1913. While riding in their horse-drawn carriage or sleigh, this lap robe would have provided a warm barrier between the Miller family and cold Oklahoma winters. 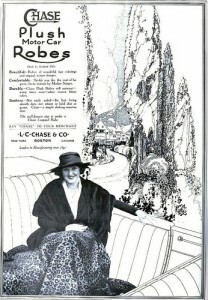 The second featured lap robe is made of brown and white vicuña fur and belonged to Phoebe Apperson Hearst. Vicuña is an animal related to the llama or alpaca and is a much more luxurious fur than bison or bear. Phoebe Hearst was the wife of George Hearst and the mother of publisher William Randolph Hearst. Mrs. Hearst used this lap robe for a number of years, both in her carriage and her Pierce-Arrow automobile, the first of which was manufactured in 1908. Mrs. Hearst was born in Missouri in 1842 and married George Hearst in 1862. Phoebe and George moved to California after their marriage where George was a successful miner and later senator. 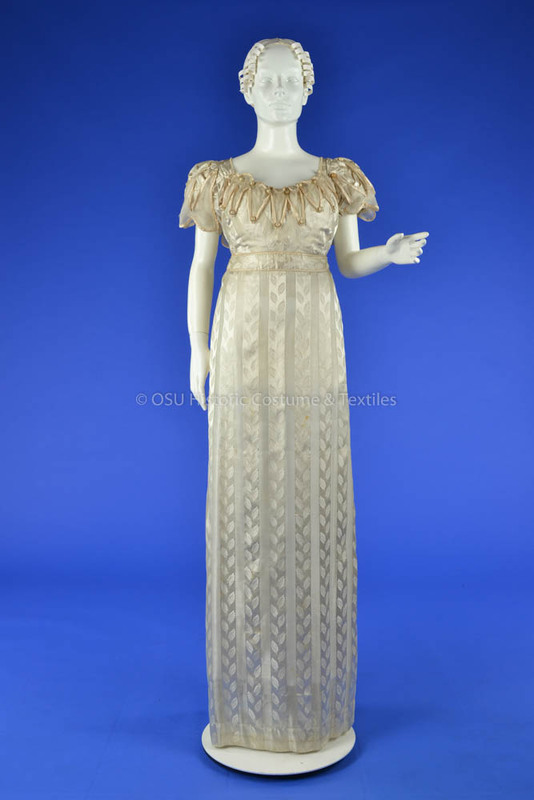 George passed away in 1891 at which time Phoebe engaged in numerous philanthropic endeavors which took her to various locations along both coasts. Mrs. Hearst lived to age 77, passing away in 1919. 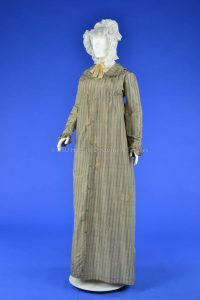 The third lap robe is made of muskrat and is lined in panné velvet with side by side kangaroo pockets for two passengers to warm their hands. It dates from the late 1910’s to the mid-1920’s, and like the vicuña is much less bulky than the bison. It belonged Martha Kerslake, who was born in England in 1869. She and her husband George moved to Rhode Island in 1904 where George ran a woolen mill. Martha and George became naturalized citizens of the U.S. in 1909. Muskrat was a highly popular and fashionable fur during this time. In addition to lap robes, muffs and stoles were also made of this fur, often with tails dangling off the ends. This lap robe features 40 muskrat tails as a decorative element. In addition to carriage blankets, travelers could also wear carriage boots. 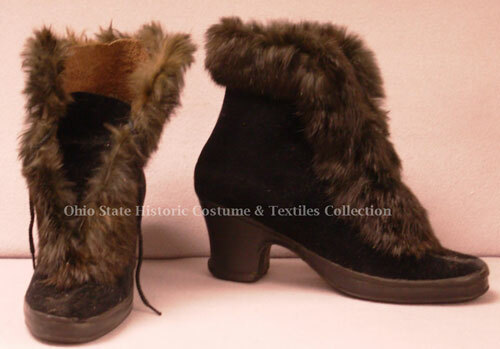 Carriage boots were worn by women in winter over ordinary shoes or slippers as protection against the cold weather. 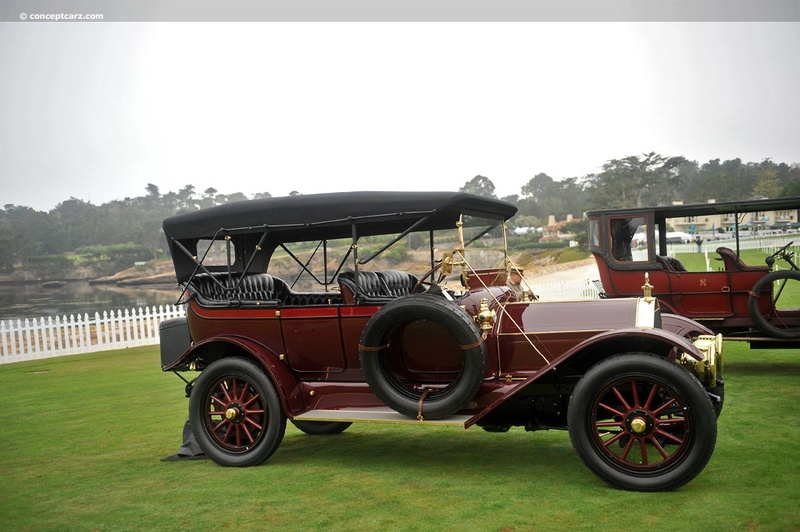 Originally worn in horse-drawn carriages, hence their name, they were also later worn in automobiles. The black carriage boots from our collection have the updated additional weather protection of a rubber sole with the word, “Hood” stamped on the bottom. The Hood Rubber Company of Watertown, Mass. primarily manufactured footwear, providing American, British and French troops in WWI with several models of boots. In August 1929, the company was purchased by the B. F. Goodrich Company of Akron, Ohio, who moved its footwear division to Watertown.